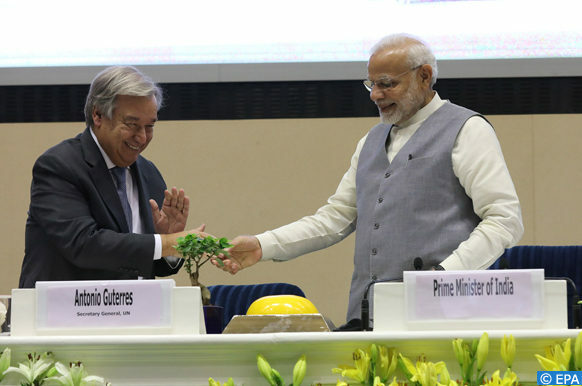 New Delhi – Indian Prime Minister Narendra Modi on Wednesday received the Champions of the Earth award from UN Secretary General Antonio Guterres in Delhi. “In PM Narendra Modi, we have a leader who realises the issue of climate change and understands the benefits of climate action. 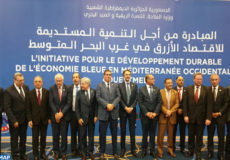 He knows the problems and also works to solve them,” Guterres added. The Award was for PM Modi’s extensive efforts to ‘Beat Plastic Pollution’- including an ambitious pledge to eliminate all single-use plastic in the country by 2022. PM Modi was also recognised for his International Solar Alliance initiative, a global partnership that aims to scale up solar energy in ‘solar-resource-rich countries’ and reduce humanity’s dependence on fossil fuels. Guterres also hailed India in his speech. “I thank India for setting an example and was pleased to present Prime Minister Narendra Modi with the Champions of the Earth Award,” the UN chief said. PM Narendra Modi was awarded the UN honour along with French President Emmanuel Macron. The two leaders were recognised in the Policy Leadership category “for their pioneering work in championing the International Solar Alliance and promoting new areas of levels of cooperation on environmental action”. “For his leadership in the fight against plastic pollution in India, and his unwavering commitment to tackling climate change around the world, UN Environment has bestowed the United Nations’ highest environmental honour upon Indian Prime minister Narendra Modi today, by awarding him the Champions of the Earth award,” UN Environment said. The UN environment agency said that under Modi’s leadership, Indian sustainable policy implementation and green grassroots initiatives have flourished, with forty million new cooking gas connections and over three hundred million LED bulbs being installed across the country. 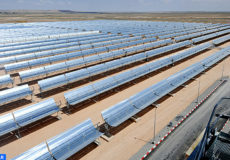 A major push towards renewable energy in recent years has propelled India to become the fifth largest producer of solar energy and the sixth largest producer of renewable energy worldwide.